I've stayed away from this bird as a subject because it is so cute that almost any image would be appealing no matter the quality or lack of quality of the design. But then I saw one on a dried milkweed and the similarity of shapes, sizes and values between the bird and the plant gave me the solid design foundation I was looking for to make it more than a rendering of an admittedly cute little bird. There's a lot going on in terms of design and if you turn it upside down it is easier to see in that way. Having said all that, they are irresistibly charming creatures and that's a big part of what the print is about. Drypoint: Similar to etching, but the lines are simply scratched into the plate manually, without the use of acid. 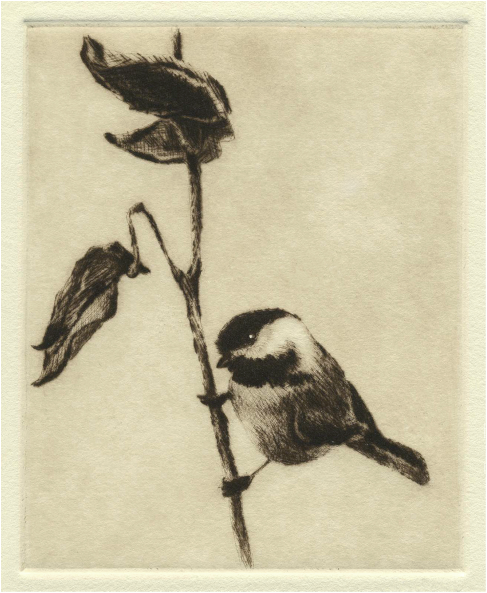 The hallmark of a drypoint is a soft and often rather thick or bushy line somewhat like that of an ink pen on moist paper.